The Forrester Study on cost savings and business benefits enabled by Watson Studio and Watson Knowledge Catalog. Watson Studio provides a suite of tools for data scientists, application developers, and subject matter experts to collaboratively and easily work with data and use that data to build, train and deploy machine learning models at scale. 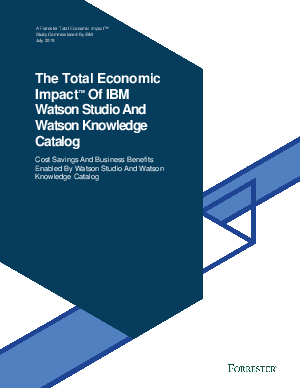 The Forrester provides readers a framework to evaluate the potential financial impact of the Watson Studio and Watson Knowledge Catalog investment on their organizations.